The future of the world is in this classroom! WELL DONE SCARLETT-ROSE YOU ARE THIS WEEKS STAR OF THE WEEK - VOTED BY YEAR 1! Confidence, Responsibility, Enjoyment, Perseverance, Pride, Creativity, Aspiration! Every Friday a person in each year group is celebrated for having a brilliant week linked to one of our seven values! November 24th - RESPONSIBILITY! award for the whole of year 1. The whole of year 1 have shown great responsibility this week for adapting to their new learning environment and taking control of their learning! December 1st - Inset Day! December 8th - PERSEVERANCE! award for Connor. D. Connor has been trying really hard this week with all of his learning. Even if something is a little tricky at first Connor has tried extremely hard to overcome this and he has produced some great work! Well done Connor! December 15th - PERSVERANCE! award for Connor, WH. He has tried extremely hard all week, and even if something has been hard he will still try his absolute best! Great effort Connor! December 22nd - ENJOYMENT! award for the whole of year 1 for thoroughly enjoying their nativity performances and putting in a great effort! All the teachers and parents were so proud! January 12th - CONFIDENCE! award for Lexi for having great confidence in retelling the story of The Little Red Hen using the talk for writing actions and even performing it in front of the class! January 19th - RESPONSIBILITY! award for Deacon. F for taking great responsibility of his work, especially his writing! He is consistently using his phonics to write each word and he has made great improvements since September! January 26th - PRIDE award for Deacon. Z for completely changing his attitude towards his learning and the work he is producing. He is trying really hard, especially with his reading both at home and at school. He has great pride which is great! February 3rd - PRIDE award for Poppy for trying extremely hard with her reading and her writing! Great work Poppy! February 9th - PERSEVERANCE award for Millie. Millie is trying extremely hard with her phonics. She is trying really hard to read and is using her phonics in her writing. Even when something is tricky to read, she breaks down the word and takes her time. Really proud of you Millie! 6th March – Parents Evening. 12th -16th March – Science week. 23rd March – Sports relief. 29th March – Easter activities & last day of term. PE will be on Mondays and Thursdays. We are lucky to have a sports coach working with us during the Thursday session which will be in the mornings so don't forget your PE kits! Reading diaries will be checked on a Monday and at least 4 signatures will be expected. If you read 4 times and have signatures from an adults, you will get a sticker on the reading chart and a Dojo! Children will have their very own homework book. At the start of each half term, the children will be given a new homework grid sheet which will include different activities. It is expected that each child completes one piece of homework a week. On Monday afternoons we will have our very own homework celebration! Each week on a Friday the children will be given class spellings to practice at home. The following Friday the children will have a spelling test. In year 1, children will also bring home a phonics reading booklet to practice their real and alien words ready for their phonics screening test. The statutory Year 1 Phonics Screening Check which will take place during the week commencing 11th June 2018. To help your child at home with their phonics, please see the websites below. What are Year 1 learning this term? This half term we will be reading 'Oliver's Vegetables'! We will be imitating, innovating and writing up our own diary entry based on this story. We will look at past and present tense, writing in different pronouns, and making sure we use chatty language! After this we will be consolidating our punctuation reading for Year 2! We will start the term by building on our knowledge of addition and subtraction! We will then build on our knowledge of place value up to 100! We are also going to be introduced to time, fractions and money! Our exciting topic this term is all about the the world around us! We are going to be looking at animals including humans, how to be healthy and also plants, trees and growing, etc. This week was anti-bullying week. This year the focus for anti-bullying week was "all different, all equal". In school we have dedicated this week to recognising and celebrating us all being unique and those traits that make us US! Each child created their own sock! This sock represented who they are as a person - what they look like, what they like to do, what makes them happy etc. On Friday this week we also celebrated Children In Need 2017. It was brilliant seeing all of the children make so much effort and come to school in their pyjamas, dressing gowns and slippers! Some children even wore Pudsey ears and face paint! The children and I had a discussion about what Children in Need is all about and some of the responses and points made were extremely compassionate and thoughtful. Deacon. F - "We have to help all of the children around the world. If we don't help them, they won't have any help at all!" Millie - "Some children aren't as lucky as we are. That's why we give them money to help them." Neeve - "I wish they could come to our school and we would make them happy." What a fantastic week year 1 have had! Miss Mann and Mrs Benger were a little bit naughty and decided to change the classroom! We changed the layout of the chairs and tables, added new things to our displays and introduced new morning activities. The children took full responsibility for all of these different things and made Mrs Benger and I so proud! A huge part of our week this week was having somebody new join our class! His name is Dexter and he is a Dinosaur! A few weeks a go we arrived into our classroom with a dinosaur egg laying on the floor! On Wednesday this week the dinosaur egg had disappeared and a letter appeared. The letter explained that Dexter had hatched and was waiting somewhere in the playground for us to go and find him. 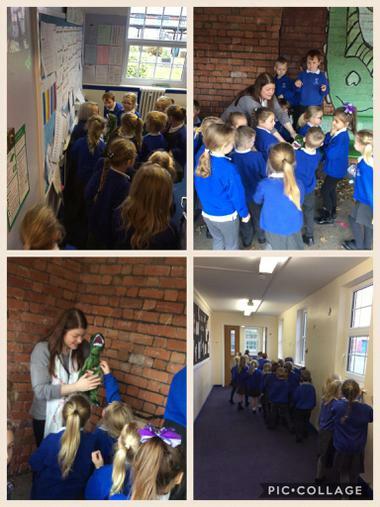 The children did a great job of finding him and took great responsibility for him. Each week, a child is going to take him home for the weekend and share the wonderful memories they have made together in Dexter's special book! In maths this week we have been looking at addition! 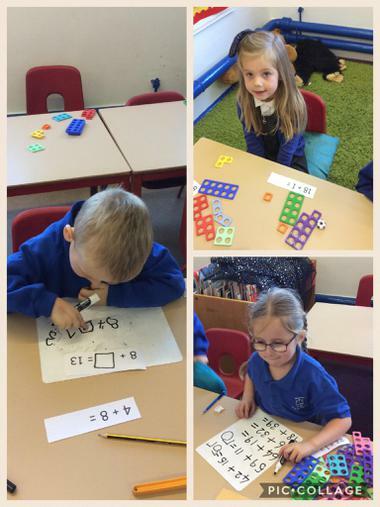 We have been using different resources such as numicon and cubes to find out the answers to number sentences and to create our own number sentences. What a busy week Year 1 have had this week! We are in full swing of getting ready for our Christmas nativity and each day the children are getting better and better with their brilliant singing! In maths this week we have been looking at subtraction! We have been using different resources such as cubes and building blocks to find out the answers to number sentences. We have been looking at matching number sentences to the correct answers and we have used number lines to help us with this. We have also been sorting number sentences and deciding if they are true and false, if they are false we have been having to 'prove it'! In English we have been completing cold and hot tasks! Our hot task ended our topic on information texts all about dinosaurs! The children had to use all of their newly learnt skills and write an information text with limited support. The childrens cold task was to write a story! This is to start our story writing topic which we will be starting properly after the christmas holidays! A big part of this week was our christmas door completion! We are having a competition in school for the best christmas door! As a class we decided that we wanted to do Polar Express. This seemed to be a very popular film with the children and I agreed. These are pictures of our brilliant Polar Express doors and corridor. The children were extremely excited and they have promised that they are going to impress Eddie the elf with their brilliant behaviour and fantastic learning! At the end of this week the children brought home a reading booklet. This booklet contains words which are real and words which are what we call 'alien' (made up words). This is going to happen each Friday. If the children read these words with you or by theirselves, we ask if you could just write a comment in their reading diaries. It doesn't have to be anything lon, just a signature or a comment which says 'dad' or 'mum' etc. If a child gets this it contributes to points on their reading chart. Practising to read these words will be a brilliant help for their daily reading in school and at home and their writing in general. It would be brilliant to have support at home with this too! What a busy week we have had! The children have had various fun activities! They have had visits of Santa, lot's of suprises from Eddie the Elf and of course, they have practiced their nativity lots of times and finally performed it! They performed it as a dress rehearsal to the rest of the school which was brilliant for them to share what they had been doing. The children recieved a great response and were being complemented in the corridors and outside during break/dinner times about how great they were! Then on the Wednesday and Thursday the children performed to their parents, grandparents, etc. They absolutely performed it and they were fantastic! What a great start to the first week of the new term! Year 1 have come back with a great attitude to their learning and it is brilliant to see! We have started our imitation of The Little Red Hen as part of our english topic on traditional tales. This picture below is off a group of children performing their retelling of the story using the talk for writing actions as well as actions that had been created by then children themselves. In maths the childrens spent learning all about the 3D shapes: Cuboid, Sphere and Pyramid! The children then learnt about different prepositional language snd what it looks like, e.g. up, down, forward, backward, top, bottom, in front, behind, etc. They then ended the week by looking at different turns e.g. half turn, whole turn, quater turn, etc. The children explored this using bee bots! They really enjoyed it! Our topic week has taken off - literally! As we begin to learn about Neil Armstrong and what he did as an explorer! The children recieved a video message from Neil Armstrong who explained who he was and why he was so significant! Year 1 also created a practical timeline of Neil Armstrongs life and followed this by writing what they would take to the moon if they were to go! I could not be prouder of Year 1 this week. They have had to do assessments for maths, reading and writing. They have tried so hard and have definitatly shown some of our values at Bilsthorpe Flying High. They have shown responsibility - for taking control of their learning, they have shown perserverance - for carrying on with something even if it is tricky or challenging and they have also shown pride - for being proud of what work they have produced or completed. This week Year 1 recieved a letter through the post! The letter was written by a group of new teachers who are looking for a job as a teacher. They had heard that Bilsthorpe Flying High is the best school in the universe but they needed to know why and that was the childrens job! They had to write an individual letter to the new teachers telling them, who they are, what makes a good teacher and why Bilsthorpe Flying High is the best school in the universe! To help us think of these answers, we had a little trip around our school. We took post it notes and a pencil and wrote down anything we saw around our school that we loved and that helps our school to be the best. Here is a picture of us on our little trip around school. Here are some examples of our letters. We had a go at doing a draft version in our books first. Week beginning 19th - 26th February 2018 - HALF TERM!